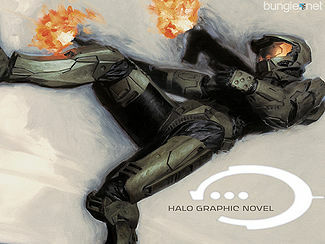 The Halo Graphic Novel is a graphic novel anthology published by Marvel Comics in partnership with Bungie Studios. The Halo series began with the award-winning popular video game Halo: Combat Evolved, which spawned several books as well as video game sequels, and is focused on the story of future humanity fighting against a powerful collective of races called the Covenant. The Halo Graphic Novel is the series' first entry into the sequential art medium, and features aspects of the Halo universe which until then had not been discussed or seen in any medium. During development of the Halo Graphic Novel, Trautmann set up a franchise group for Halo media and was told that Bungie were unhapppy with the creative team, consisting of John Ney Rieber and Adi Granov, and was told by Pete Parsons that Bungie would rather have Alan Moore and Joe Kubert. This story takes place during the events of Halo: Combat Evolved. When communications from a Covenant agricultural support ship, the Infinite Succor, are mysteriously terminated, Special Operations Commander Rtas 'Vadumee, also known as Half-Jaw, and his squad of Special Force are sent to investigate. What they find is a peril more deadly and terrifying than any human threat; creatures never officially seen before by Covenant nor human eyes alike. Set just before the events of Halo 2, Armor Testing tells the story of Maria-062 who tested the MJOLNIR Mark VI armor before it was handed over to John-117. One of the first depictions of civilian life in the Halo universe, Second Sunrise Over New Mombasa follows the Covenant invasion of Mombasa from the viewpoint of Benjamin Giraud, a journalist and war photographer in the employ of ONI's Section II. The story was illustrated by Jean "Moebius" Giraud. Surrounding the boxes are pictures and maps of above mentioned operation and other related smaller text areas. The information provided by the combination of these logs seem to imply that Sergeant Avery Johnson is a Spartan from the ORION (Spartan-I) program. The image itself looks like a shot of someone's desk. Doug Alexander - Master Chief with a shotgun in hand and SPARTAN-062 (without her armor) wielding a flamethrower, surrounded by Flood. Rick Berry - An unknown Sangheili soldier in a cloudy environment. Geoff Darrow - Master Chief standing over one destroyed Flood Pod infector, while behind him a group of a hundred Pod infectors gather. Tsutomu Nihei - An Elite combat form roaring. 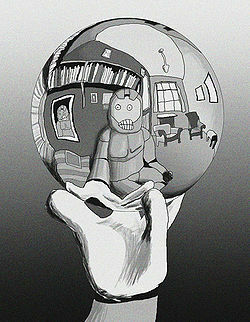 Frankie made this take on Dutch Artist M. C. Escher's famous drawing for the book. Frank Capezzutto III - A plasma grenade nearly missing a trio of UNSC Marines, including L. Jenkins and L. P. B..
Geof Darrow - A two-page spread of Master Chief standing over a destroyed Flood Pod infector holding two SMGs, with dozens more Pod infectors coming up behind him. A page from Armor Testing. A page from Second Sunrise Over New Mombasa. An image of Lorraine McLees' art piece. ↑ Halo.Bungie.Org: "Halo Graphic Novel Preview"
↑ IGN: "Halo Graphic Novel Poster Preview"